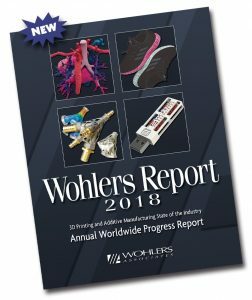 The annual Wohlers Report has become the most highly anticipated guide to the additive manufacturing industry since its first publication 23 years ago. With 76 co-authors in 32 countries, the report represents knowledge and expertise from the largest global network of AM professionals. As new players enter the market, from system manufacturers and material producers to software and service providers, Wohlers Report 2018 is undoubtedly the go-to guide for the latest insights and forecasts into the world of 3D printing. This year is no different, with the 2018 edition highlighting several key insights, including news that metal AM system sales have increased by an impressive 80%. Also, the news looks positive for the additive manufacturing as a whole, with the industry seeing a 21% growth last year. 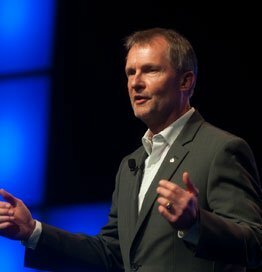 Terry Wohlers, founder and President of Wohlers Associates, is one of the industry’s leading voices, and oversees the publication of the Wohlers Report. We were fortunate enough to speak with Terry about the findings from the latest report, the challenges faced for companies implementing additive manufacturing and his thoughts on the future of AM. What were the most exciting findings from Wohlers Report 2018? One of the most interesting findings of all was the dramatic growth of metal AM machines. Sales grew by 80% in 2017, which is a large increase, given that we’ve been tracking sales of metal AM systems for 18 years. Clearly, sales of metal AM systems are gaining significant traction. Another finding is the increase in the overall number of manufacturers producing industrial AM systems. For years, we’ve separated AM systems into desktop machines that sell for under $5,000 — the average selling price of which is about $1,000. The second category is the industrial systems that sell for above $5,000 — and this is where it gets interesting. We’ve seen the number of companies selling industrial AM systems grow from 97 in 2016 to 135 companies last year, and 60 of them are in Europe. 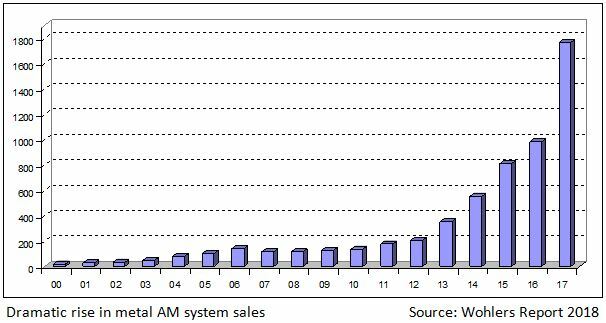 So the rise in the number of AM system manufacturers is another interesting trend that we’re seeing. What factors do you attribute the growth in metal AM systems to? Companies are buying a higher quantity of metal AM systems to meet their production needs. Over the past few years, a number of companies have bought one or two systems for testing and qualifying the process and materials. Now, companies are adding system for production, which requires significantly more capacity. Another reason is that Desktop Metal reported system sales for the very first time last year, which amounted to 357 AM systems. This makes up a large percentage of the total metal AM machines sold in 2017. Likewise, we discovered 12 Chinese companies that are now manufacturing and selling metal AM systems and estimated 213 systems sold by these companies last year. How much growth in additive manufacturing are we seeing in overseas markets? We’re seeing more development in China than in many other regions. Likewise, we’re seeing interesting activity in Japan, Singapore and a few other countries. China is clearly capitalising on the potential of additive manufacturing, and wants to be a big part of the industry in the future. As additive manufacturing is increasingly adopted by companies and manufacturers, what challenges will they have to face in implementing the technology? The challenges faced in implementing AM technology are not always well understood by companies. One obstacle is the preparation of data and optimising the designs for production. The second obstacle is post-processing, which involves everything that occurs after the parts have been produced on the AM machine. With metal AM, many steps are involved to ensure quality. This includes properly removing the powder and going through a stress relief heating cycle so that the parts do not warp and distort from the heat residual stress built up in the parts when they are removed from the build plate. A lot of time is often required to cut and grind away the support structures. Other steps include CNC machining and other finishing work, as well as hot isostatic pressing, which helps to ensure that the part does not contain any porosity. Some of the steps depend on the application of the part. Those are among the obstacles and considerations that companies they may be unaware of beforehand. It’s very important to understand them because they require a substantial commitment and investment. How much of a role will automation play in streamlining the processes you’ve outlined? Post-process automation will play a key role. One key issue is how to minimise the need for support structures, since that’s a big part of the reason why you’d want to implement automation. Reducing them in advance will result in reducing the cost of programming robots and fine-tuning the automation process. Users of metal AM should also ask how they can optimise the design to reduce the number of support structures, or even eliminate them in some cases. Creative techniques can be applied to achieve this, although it depends largely on the design. Overall, automation will play a big role in post-processing, from automated material handling, to moving and positioning heavy build plates with parts attached to them. Finally, what’s the next trend in AM that you’re most excited about? One important trend is the development of design software tools for AM. The next step is for them to become fully and seamlessly integrated in to popular CAD software products. Ideally, designers prefer to work in a single design environment without the need to move data from one software product to another. I am seeing more resources being poured into developing strong, integrated design tools. Companies such as Autodesk, Dassault, PTC, and Siemens are beginning to take AM seriously and exploring ways to make it as easy and as painless as possible for designers of all types to optimise their designs for additive manufacturing. You can find out more about Wohlers Report 2018 and Wohlers Associates here.